Why would a painter who was very successful with his own work become a forger of old masters? In the case of Dutchman Han Van Meegeren, the answer would seem to have been respect. His own work sold well, he was in demand, doing a lot of commercial art, but after the critics savaged an exhibition of his own paintings as derivative, he decided to have the last laugh on the art world – and make a fortune in the process. Although he actually studied as an architect, although he never qualified (one building he designed still stands in Holland), his real love was art, and in 1913, at the age of 24, he went to study art in The Hague, winning an award for his work before becoming a teacher and commercial artist. His first exhibition was well-received and brought him plenty of commissions, but his second, in 1927, found the critics tearing his work apart for its lack of modernity. He’d already been producing work in the style of famous old painters like Frans Hals, and decided that he’d go one step further and produce fake masterpieces from the old masters. Of course, there’s more to forgery than just painting. 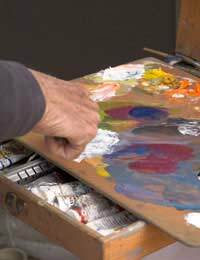 The canvasses need to be old, as do the paints, and even the types of brushes in order to be convincing. It took Van Meegeren a full six years to develop the technical side of his art forgery, and it wasn’t until 1936 that he produced his first fake painting, The Disciples At Emmaus, made to look exactly like work by the great Dutch artist Johannes Vermeer. It was so good in every respect that the greatest experts on Vermeer authenticated it, and it sold for the equivalent of millions of pounds. Van Meegeren used the proceeds to purchase a large estate and continued both his own artwork and the forged Vermeers, both of which sold well, making him into an incredibly wealthy man. As the Second World War broke out, Van Meegeren and his wife moved back to the Netherlands from France, where they’d settled some time before, and he continued to paint. It was during the war that he produced yet another fake Vermeer, Christ With The Adulteress, that would be his downfall. The art dealer he used for his work sold it to the Nazi leader Hermann Goering for a huge amount of money. After the war, authorities questioned Van Meegeren’s art dealer about the Vermeer, and the trail lead back to Van Meegeren himself, who was charged with collaboration for selling Dutch art treasures. The only way to avoid the charge was to admit the forgery – which he did, and proceeded to prove how he’d done it. In the end he was simply charged with forgery and sentenced to a very lenient one year in prison, while a commission went through many old works to discover his forgeries, of which there were far more than they’d imagined. In November 1947, on the last day he could have appealed his sentence, he had a heart attack and was rushed to hospital. There, a month later, he suffered another heart attack and died on December 30th. His estate was sold off to pay back those who’d fallen victim to his forgeries, and the fakes he’d created in jail to illustrate his methods were also sold. Interestingly, since his death, all those forgeries have been exhibited –as Van Meegerens – around the world.